When you even think of the words Humpty Dumpty, one cant help but start going through the nursery rhyme in our heads. This tale of the anthropomorphic egg and his tendency to fall from high places has existed for quite some time now. You might ask why there even needs to be a slot based on this man egg to begin with, well sir, you’d be stupid to think that. Push Gaming have gone above and beyond, both over the wall and back again, to give you the player, an online experience that you will never forget. This is a lot here to make sure this egg stays solid, although cracking ol Humpty Dumpty might take a few spins to get an insight on this egg overall. Expect a plethora of different features to accompany this slot, as well as a few hidden ones that could scramble even this eggs brains. Not many online game devs can hold a candle to the acumen of a company like Push Gaming. The quality of games they produce coupled with their overall mentality when it comes to user experiences separate them from the pack. Their games can leave you in a lull of excitement unlike anything ever experienced before, that’s just the kind of company they are. Learn more about this developers range of games on https://www.easyslots.com online casino here. The gameplay of Humpty Dumpty is rather simplistic in its approach, what Push Gaming were going for was beauty in simplicity, we’d say they succeeded in their efforts. 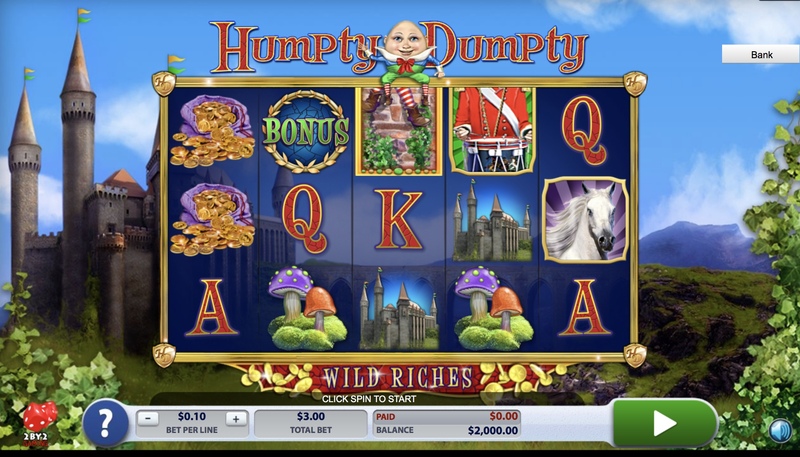 The command bar can be found at the bottom of the screen, this allows players to adjust Humpty Dumpty to how they want it. Once you are happy with the settings and your bets per line, you’re ready to go. This is a 5 reel slot that holds 3 symbols over 25 pay-lines total. The pay-lines here are fixed so it would be wise to maybe play a few spins on a lower bet just to get a feel for the gameplay. The play and bet buttons are self-explanatory and shouldn’t require that much thought. It also goes without saying that players are victorious when they match combinations of symbols on the pay-lines from left to right, doing so will knock ol Humpty off the wall and will provide some rather cracking cash prizes. There are more general Easy slot promotions here. There also happens to be an autoplay mode here. 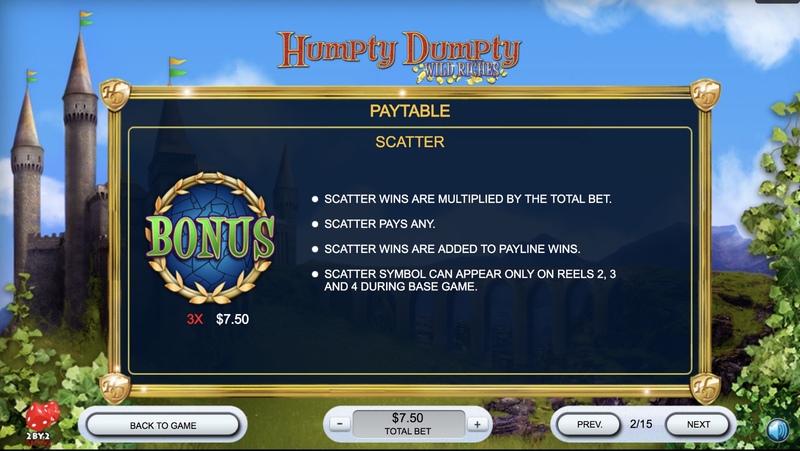 This feature allows players to set a base amount of games they’d like to spin hands free. This mode can be stopped/started at any moment. Simply hit the autoplay button at the bottom of the screen to begin this feature. You can discover more the full list of games here.